In August 1851, the German traveler Baldwin Möllhausen (1825-1905) went with his employer Duke Paul Wilhelm of Württemberg on an expedition from Kansas to Nebraska. On October 1 the Duke and Möllhausen reached Fort John at the “Scott Bluffs” . Now began the real adventure . They were both alternately sick and had to maintain each other, the carriage of the Duke got stuck in the river, they escaped a prairie fire and they had to pass various confrontations with hostile Indians [ Oglala Lakotas ]. They lost draft animals by cold and exhaustion , were caught in a snowstorm and got lost. On November 19 they reached then the Sandy Hill Creek, their final stop . The last horse died , and they sat in a small leather tent in a snow desert. After 6 days, a stagecoach from Fort Laramie passed their camp. The duke succeeded to buy a place for himself for $ 100. He left his companion shamefully in the lurch (with the promise to send help). But the Duke assumed that Möllhausen had not survived . In his diaries he has never mentioned him from then on . 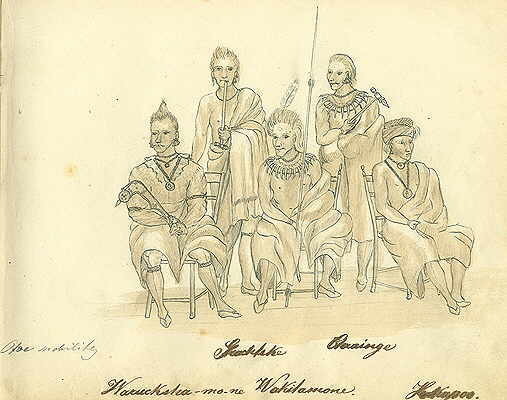 Möllhausen was rescued after 6 weeks by Oto Indians. The leader of the Otoe - hunting party was Wa -ki- ta -mo -nee, who freed Möllhausen in January 1852 from his desperate situation at Sandy Hill Creek and so saved his life. His whole lifetime Baldwin Möllhausen thought in gratitude and friendship of the Otoe Indians. Has anybode more on Wa -ki- ta -mo -nee or Wo-nes-hee? Or are there Otoe traditions about this event? As far as I know, that book is online readable , but only in German language .